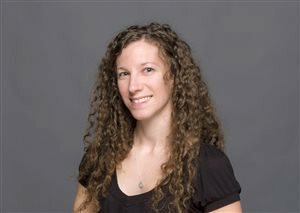 This guest blog was written by Laurel Kornfeld in response to an opinion piece recently published on Forbes.com. 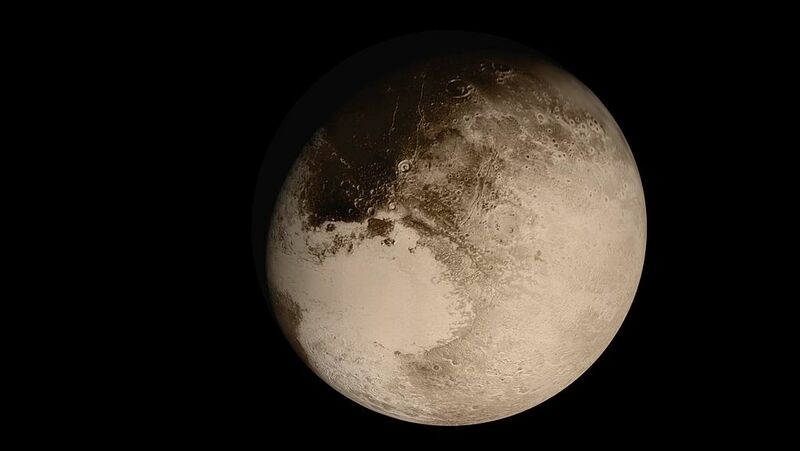 You can read Laurel's additional guest blog on our site,"The case for planet Pluto," here. Ethan Siegel’s May 8, 2018 article, “You Won’t Like the Consequences of Making Pluto a Planet Again” is rife with misconceptions about the geophysical planet definition supported by Alan Stern and David Grinspoon in their May 7 Washington Post article. Beginning with the title, Siegel’s article makes a lot of unproven assumptions regarding public sentiment, the position of planetary scientists, and the motivation of those who favor a geophysical planet definition over a dynamical one. How does he presume to know that members of the public will not like the solar system having 115 planets? Has he conducted a poll on this? Many people actually do like and are excited by the idea of the solar system having a large number of planets much more than they like the notion of removing planets for what often appear to be incomprehensible reasons. Siegel repeatedly uses phrases such as “the eight planets of our solar system” in a way that wrongly assumes this position is somehow more “official” or more legitimate than that of those who view dwarf planets as planets and therefore see our solar system as having a minimum of 13 planets and counting. This is why his wording itself throughout the article is problematic. Significantly, the 2006 IAU definition was adopted by just four percent of its members, most of whom were not planetary scientists but other types of astronomers. It was also opposed by an equal number of professional planetary scientists in a formal petition. Yet somehow, the media treated the IAU resolution as gospel truth and ignored the fact that it was enacted by the wrong group of experts and opposed by just as many professionals in the field, leaving the issue as an ongoing debate. Just who is Siegel speaking for when he says, “For astronomers who study our solar system, this (eight planets) is just fine?” Many planetary scientists do not at all share this view. Neither is it accurate to say the eight largest solar system planets have a common origin that the dwarf planets do not share. Every one of the solar system’s planets has a unique formation history. Beyond gravitational dominance, these eight planets do not have distinct properties that dwarf planets do not share. Dwarf planets actually have more in common with terrestrial planets than terrestrial planets have with gas giants. Jupiter and Saturn are composed largely of hydrogen and helium. They have no solid surfaces and “mini-solar systems” of moons and rings. In contrast, both dwarf planets and terrestrial planets are largely composed of rock and have solid surfaces that can accommodate landers. Pluto and Earth both have nitrogen in their atmospheres; are geologically differentiated into core, mantle, and crust, and have large moons formed via giant impacts. A classification system that puts Earth and Jupiter in the same category while excluding Pluto is therefore highly problematic. Advocates of the geophysical definition view the IAU resolution as a step in the wrong direction. At a time when new worlds are being discovered both in our outer solar system and beyond, we should be expanding the concept of planet to include these new discoveries rather than narrowing it to one based on the unscientific idea that we need to keep the number of planets small and countable. The claim that the geophysical definition considers only an object’s intrinsic properties and not its location is blatantly false, as is the statement that scientists who prefer the geophysical definition are “ignoring all of astronomy” and are “looking down at their feet” rather than looking up. Spherical objects’ locations are acknowledged in the geophysical definition with adjectives that modify the noun “planet.” For example, a “satellite planet” is a spherical moon. The term “satellite” recognizes that these objects are satellites of other planets. Similarly, the term “dwarf planet” is an acknowledgement that this class of objects, while having the intrinsic properties of planets, do not gravitationally dominate their orbits. Far from ignoring all of astronomy or “taking the issue to an extreme,” the use of the adjective dwarf for a subclass of small planets is completely in line with other uses of the term “dwarf” in astronomy, with dwarf stars being a recognized subclass of stars, and dwarf galaxies being a subclass of galaxies. One could say Siegel overlooks all of planetary science by determining objects should be classed solely by their location, as this means none of the features or processes found on these small worlds matter. Ironically, the graphic Siegel displays closely resembles the graphic at left, published in an article by Alan Stern and Hal Levison in 2002. However, while the 2002 study distinguished between gravitationally dominant planets, which it referred to as “uber planets,” and non-gravitationally dominant planets, which it referred to as “unter planets,” the authors never claimed that the latter were not planets at all! The dividing line is the same on both charts. 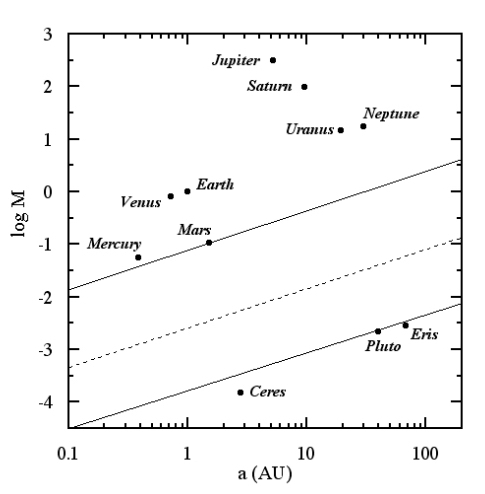 Interestingly, the boundary on Siegel’s chart does not distinguish between planets and non-planets but between one class of planets that dominates their orbits, which corresponds to the solar system’s terrestrials, gas giants, and ice giants, and another class that do not dominate their orbits but based on their intrinsic properties are still planets, which corresponds to the dwarf planets. The IAU also referred to this study when making its decision but like Siegel, assigned its own, different interpretation of its conclusions, running counter to the point made by Stern and Levison. Like the four percent of the IAU who voted in 2006, Siegel advocates looking solely at an object’s location while completely ignoring its intrinsic properties. Based on those complex properties, neither Ceres nor Pluto is an asteroid. Classifying these objects solely by their surroundings blurs the distinction between the majority of tiny, shapeless asteroids and KBOs, which are held together loosely by chemical bonds, and those that have attained hydrostatic equilibrium and therefore experience the same complex processes as their larger terrestrial counterparts. Putting primacy on location also brings with it the potential of the same object being classed as a planet in one location and as not a planet in another location. If Earth were in Pluto’s orbit, it could not clear that zone of Kuiper Belt Objects and therefore would not be considered a planet. The further an object is, the larger an orbit it has to “clear,” meaning the dynamical definition is inherently biased against planets orbiting at great distances from their stars. The issue at hand is not whether dwarf planets would become less interesting if classified as non-planets; it is that they would be erroneously lumped into a group of objects, most of which are very different from them. While classification systems will always have some borderline ambiguous objects, the technology used to observe them continues to become more sophisticated and with time, will be able to answer questions such as whether a borderline object is or is not in hydrostatic equilibrium. Contrary to Siegel’s claim, a broader definition is not a “meaningless” one. This notion has been expressed by those who somehow think the number of planets must be kept small in order for the term to be “special” and meaningful. This preference is purely based on emotion, on people’s having grown up with a solar system that has a limited number of planets. If broadening an umbrella term to include multiple subcategories makes that term “meaningless,” then the words “star” and “galaxy” must already be devoid of meaning and confusing to the public. Describing advocates of a geophysical planet definition as “desperate to save Pluto’s planetary status” is not just false; it also amounts to an ad hominem attack. Using hydrostatic equilibrium as the defining characteristic for planet status is not about Pluto but about a new paradigm in which an object’s intrinsic properties are the primary—though not sole—criteria in classifying that object. Hydrostatic equilibrium is not just about being round; it is about being massive enough for an object to be shaped by its own gravity rather than by chemical bonds. Location matters, but it is not the sole determinant of an object’s properties. Pluto was thought to be too far from the Sun to have an internal heat source and active geology, yet it has both in spite of its location. If the New Horizons mission has taught us anything, it is that our expectations are not always right, and in addition to considering both intrinsic properties and location, we need to study objects up close without preconceived assumptions to get the full scientific story.